Farmer, educator, MLA (1923-1927), MLA (1927-1932), MLA (1933-1936), MLA (1937-1940), MLA (1941-1945), MLA (1946-1949), MLA (1950-1953), MLA (1954-1957), Premier of Manitoba (1948-1958), MLA (1958-1959), MLA (1959-1962), MLA (1963-1966), MLA (1966-1969). Born at Flee Island near Portage la Prairie on 27 May 1895, son of John Howard Campbell (1852-?) and Mary Campbell (1853-? ), he worked as a farmer and teacher at Flee Island School before entering politics. He was also active as a Freemason, serving as Master of Assiniboine Lodge No. 7 in Portage. In 1922, Campbell defeated several other contenders to become the United Farmers of Manitoba (UFM) candidate for Lakeside. At the UFM nomination meeting, he made a virtue of his inexperience as a professional politician. A commanding speaker, he was soon regarded as a rising star in the party. The UFM swept Manitoba’s countryside in 1922, and Campbell was elected, being returned in each of 1927 and 1932 elections. The UFM, which governed as the Progressive Party of Manitoba, was founded on an ideology of non-partisan, managerial government, with special attention to rural concerns. The Progressives formed an alliance with the Manitoba Liberal Party in 1932, and Campbell (among with the others in his party) subsequently became known as a “Liberal-Progressive.” Re-elected in July 1936, Campbell was sworn in as Minister of Agriculture in John Bracken’s government in December 1936. He also became Minister of the Manitoba Power Commission on 5 February 1944. In this capacity, he was responsible for overseeing a rural electrification program, which created the framework for Manitoba Hydro. Bracken’s government created an all-party coalition in 1940, with members of the Conservative, Cooperative Commonwealth Federation (CCF), and Social Credit parties all holding cabinet positions. Campbell faced no opposition in the election of 1941, won by acclamation in 1945 and 1949, and was re-elected or acclaimed in 1949, 1953, 1958, 1959, 1962, and 1966. 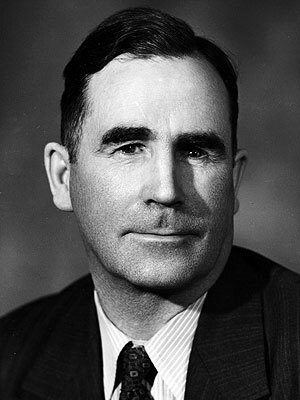 In 1948, when Premier Stuart Garson jumped from provincial to federal politics, Campbell defeated Conservative leader Errick Willis in a vote of the coalition caucuses to become the province’s next Premier. He was sworn in on 13 November 1948, only the second native-born Manitoban to serve in this office. His government continued the rural electrification program and improved the provincial highways, but was otherwise cautious and conservative, opposing government expansion and bilingualism. Campbell commissioned a study on alcohol sales (written by former Premier Bracken) that brought about some reforms; nevertheless, the province maintained a number of restrictive blue on alcohol and Sunday shopping. Manitoba’s education system remained backwards, having the most one-room schoolhouses in Canada. The coalition government ended in 1950, with the Progressive Conservatives (as the Conservatives were then called) leaving in protest against Campbell’s “minimal-government” philosophy. On 21 December 1920, he married teacher Margaret Gladys Crampton (?-?) at Portage la Prairie. They had seven children: Keith Campbell, Terence Campbell, Craig Campbell, Sharon Campbell, Dawn Campbell (wife of Jack McKeag), Sonya Campbell, and Dwili Campbell. In 1957, he was inaugural member of the Order of the Buffalo Hunt. During Manitoba’s centennial year celebrations in 1970, he received the Centennial Medal of Honour from the Manitoba Historical Society. In 1972, he was made an Officer of the Order of Canada, and a member of the Manitoba Agricultural Hall of Fame. He received the Queen Elizabeth II Silver Jubilee Medal in 1977. He was awarded honorary doctorates by the University of Manitoba (1952), Brandon University (1967), and University of Winnipeg (1978). He died at Winnipeg on 23 April 1995, at age 99. Personal correspondence for the period 1936 to 1950 and other papers are at the Archives of Manitoba. An unpublished personal memoir is held by the Department of History at the University of Manitoba. Campbell of Manitoba by Gildas Molgat (1961). “Douglas L. Campbell, 1948-1958 ” by James Muir in Manitoba Premiers of the 19th and 20th Centuries, edited by Barry Ferguson and Robert Wardhaugh, Canadian Plains Research Centre, 2010. Obituary, Winnipeg Free Press, 25 April 1995, page 33.